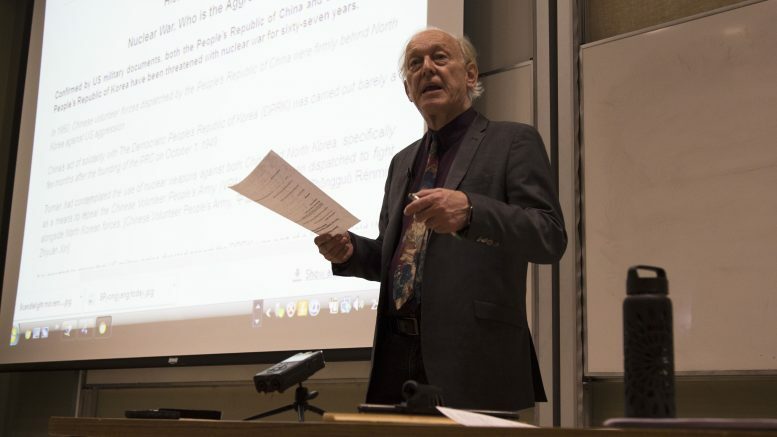 U of O professor emeritus of economics, Michel Chossudovsky, visited the University of Manitoba Jan. 15 to speak about the dangers of nuclear war. In a lecture co-hosted by Peace Alliance Winnipeg and the U of M’s Geopolitical Economy Research Group Jan. 15, University of Ottawa professor emeritus of economics Michel Chossudovsky spoke to students on the dangers of nuclear war in light of heated exchanges between North Korea and the Trump administration over the past year. A popular figure among anti-globalization activists and founder of the Centre for Research on Globalization, Chossudovsky’s publications and research have earned praise from theoretical linguist Noam Chomsky and several other contemporary anti-establishment intellectuals. Chossudovsky’s lecture was based on the premise of his recent book, Towards a World War III Scenario: The Dangers of Nuclear War. In the 1940s, American scientists working with an initial $6,000 in funds, began organizing a project to exploit the then-newly discovered process of nuclear fission for military purposes. As the military potential of the project grew more evident and following the U.S. entry into WWII, the U .S. Department of Defence – then called the War Department – was handed responsibility of the project and began orchestrating the construction of an array of pilot plants and manufacturing facilities. As a way of preventing undue attention, the project was soon after dubbed the Manhattan Project. “The three partners of that Manhattan Project were the United States, the United Kingdom, and Canada,” Chossudovsky said. Although Canadians may not be aware of this, Chossudovsky noted, Canada’s integral role lay in supplying uranium, the chief material necessary in the making of a nuclear bomb. Canada “was also privy to a lot intelligence and science on the construction of the first nuclear weapons,” Chossudovsky said. The Korean War, which resulted in the split between the two Koreas, began in 1950 after the communist North Korean army crossed the 38th parallel – a boundary that divided the Korean Peninsula between Soviet and American occupation zones following the surrender of Japan that had been occupying Korea during WWII. Three years later, an armistice agreement signed by the North Koreans, China, and the U.S. marked the end of the war. Chossudovsky argued that the Korean War was the “most devastating” war in world history. “If you look at World War II, the Soviet Union, Germany, Yugoslavia, lost an absolute number – large numbers of [their] population,” he said. “In the case of the USSR it was almost 10 per cent, but here we are talking about 30 percent. “In effect, what happens is that the U.S. has overwhelming power over the entire military apparatus of South Korea,” Chossudovsky explained. Chossudovsky said that reunification of the two Koreas could help establish “an extended trading system which would go from South Korea up to North Korea and then up into” the Russian city of Vladivostok and into the Liaoning province of China. “So in effect, this would become a trading bloc and eventually it might be integrated into China’s Belt and Road initiative,” he said. China’s Belt and Road initiative was established by Chinese president Xi Jinping and aims to reshape China’s international engagement through building infrastructure across Asia, Africa, Europe, and the Middle East and create new foreign markets for Chinese products. Chossudovsky asserted that the mainstream U.S. narrative on North Korea is perpetuated by the American administration to sustain an agenda that emphasizes a maintained dominance over the region. “If you read the newspapers and listen to network television,” he said, “they will represent North Korea as some shithole country with no architecture, no social services, poverty and so on. “We are trying to represent these countries as that they don’t really take care of their citizens. On July 7, 2017, a United Nations resolution calling for the prohibition of nuclear weapons was passed in the General Assembly, with 122 countries voting in favour. The United States, Canada, and other NATO members did not attend the negotiations. “Is a country with 25 million people somewhere in East Asia a threat to global security?” he questioned. “In the minds of all Koreans, there is not a single family in North Korea which hasn’t lost a loved one. Chossudovsky said that the best way forward is for South Korea to recycle the OPCON agreement in favour of evolving the armistice agreement with North Korea into a peace agreement. “We have to unite against this madness and diabolical agenda which ultimately turns realities upside down. When the lie becomes the truth, there’s no moving backwards. And that’s what is happening. We are told that war is a humanitarian endeavour.